. Persimmon art motives . The Japanese landscape in autumn is unthinkable without the persimmon tree. The red-orange fruit is in beautiful contrast with the clear blue autumn sky, the landscape looks peaceful. The oriental persimmon is native to China, where it has been cultivated for centuries and more than two thousand different cultivars exist. It spread to Korea and Japan many years ago where additional cultivars were developed. The plant was introduced to California in the mid 1800's. 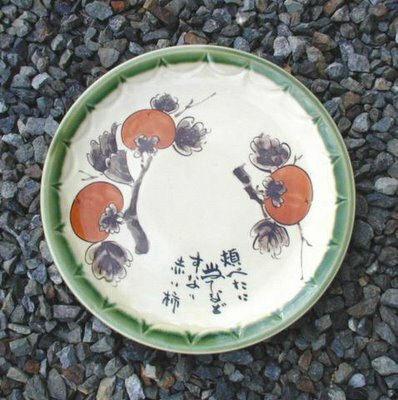 The bitter version has been introduced to Japan in olden times and the sweet kaki came to Japan during the Kamakura period, via China. Read more here, especially abou the many varieties grown worldwide now, like the Sharon fruit, Jiroo (Jiro) and Suruga varieties. 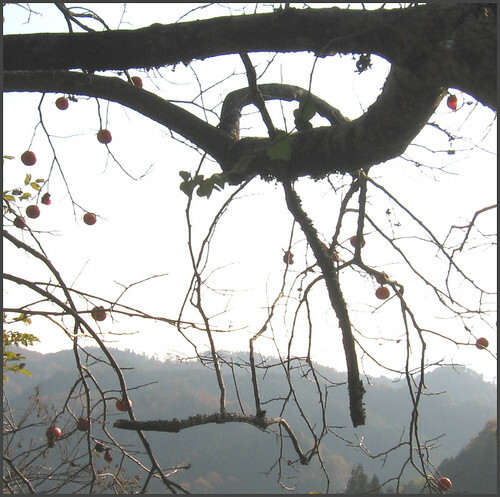 The kaki tree is an example as to how a plant or tree can be the subject of haiku during different seasons. 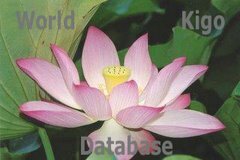 Here is a list of some of the many kigo connected with kaki. Among all the wakaba, the young leaves, the ones of the persimmon tree are especially bright and delightful. a delicacy eaten later on in winter. a special kind that is skinned and dried for preservation, then hanged on a string it becomes the the tsurushi-gaki. a common sight in front of every farmhouse in Japan in autumn. another name for the hanging kaki fruits like a woven straw curtain (sudare).
. kushigaki 串柿 ( くしがき) dried persimmons on a stick . a wild kind in the forests. One last kaki (or a few) is left on the tree to "watch over it". also called "taking care of the children"
Usually the kaki fruit high up in the tree are eaten by craws as a favorite feed and the fallen fruit are eaten by the badgers (tanuki) to provide for their winter fat. The thick leaves of the persimmon show a special coloring in autumn, children like to pick them up and keep them until they wither.
. goshogaki ni tanomare gao no kagashi kana . Shinanogaki 信濃柿 しなのがき ) "Persimmons from Shinano"
..... Mamegaki 豆柿（まめがき）"persimmons like beans"
Calling kakishibu a “dye” is a bit of a misnomer. Made from the fermented juice of unripe astringent persimmons, the color comes from the tannin molecules linking together and forming a coating. More than a coloring agent, kakishibu also has strengthening, antibacterial and waterproofing properties. 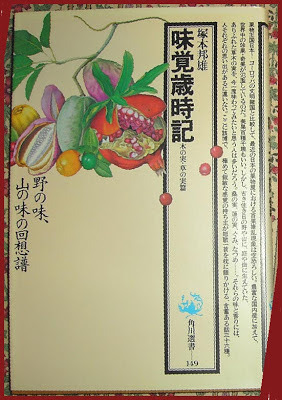 Kakishibu was used in China and Korea, but reached its ultimate utilization in Japan. It was used as a wood preservative, waterproofer, insect repellent, folk medicine, and on washi (Japanese paper), fans, parasols, clothing and in sake production. Japanese artists and craftsmen use kakishibu on wood, washi and textiles. For textiles, cellulose fibers are well suited to kakishibu, especially bast fibers. However, it is also satisfactory on silk and even some synthetics and synthetic blends. Yarn can be dyed and woven, knit or crocheted. Cloth can be dyed by immersion dipping, or surface designs can be created by brushing. Katazome (stencil patterning), tsutsugaki (paste resist drawn with cones), shibori and other techniques are well suited surface design options. Long looked at as one of those “charming-folksy-but-largely-not-applicable-today” things, kakishibu is enjoying a revival in a more eco-aware world. Japanese craftsmen are producing clothing for chemically sensitive skin. Builders are utilizing kakishibu as an interior wood finish to combat sick house and dyers are embracing kakishibu for its beauty and user friendliness - no dyer contact with chemicals and no disposal problems. Largely unavailable and known in America primarily among hand papermakers, kakishibu is poised to become an exciting addition to the textile artists palette. The sumi-e of Sesshu and the tea ceremony room give the feel of simplicity. 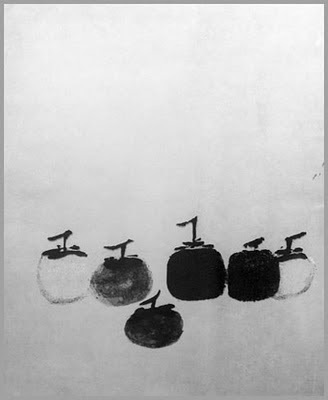 Another example is Mu Chi's painting of persimmons. 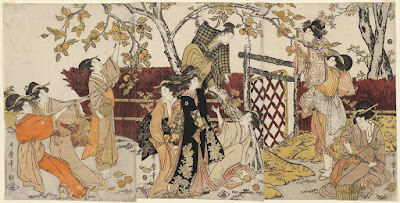 Profundity animates the Noh plays of Zeami and the Haiku of Basho. The frog-leap-pond Haiku - one of the masterpieces of Basho - may provide an especially good insight into what is meant here. Creativity emerges strongly in the gardens of Muso and the calligraphy of Ryokan. They clearly transcended their masters' style. Sesshu also serves as an example here; he learned his technique from Josetsu and Shubun in Japan and Kakei in China, but his final landscapes were incomparably his own. Vitality shimmers through the calligraphy of Hakuin and Ikkyu. Their calligraphy overflows form without violating it. Vitality is also evident in the vigor and free flow of all Zen art. This was a favorite game of kids in the Edo period. The word used to be mentioned as kigo in the older saijiki, but is now lost. Children (and grown-ups) would bet on the number of seeds (kernels) in the fruit, either just an odd or even number, or who was closest to the real number of stones. CLICK for enlargement of the details ! Persimmons were seen as "sweets" and quite popular. 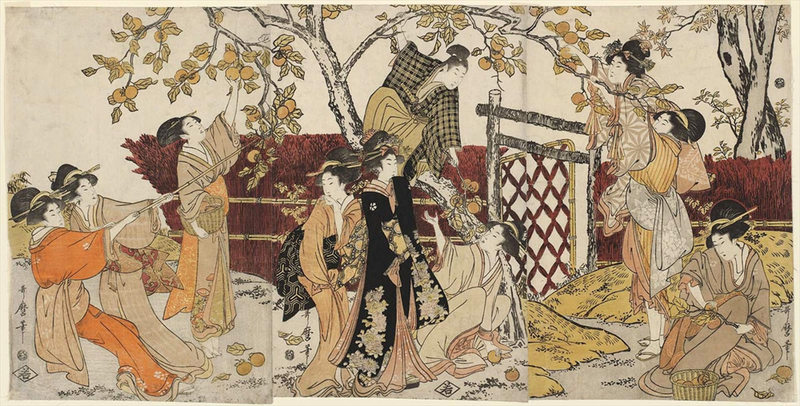 Here is a group of ladies harvesting, with a young man in the tree, handing down branches with the fruit. Other ladies are shaking the tree. The two ladies in the middle who are watching the scene are maybe the lady of the house and her daughter, observing their servants doing the job. Rakushisha 落柿舎 "Hermitage of the fallen persimmon"
This hokku is from the 3rd month (April) of 1824, when Issa was living in his hometown. It is the mating and nesting season for birds, but Issa feels pathos in the fact that one bird couple has built their nest in a persimmon tree that will soon become material for bows and arrows. 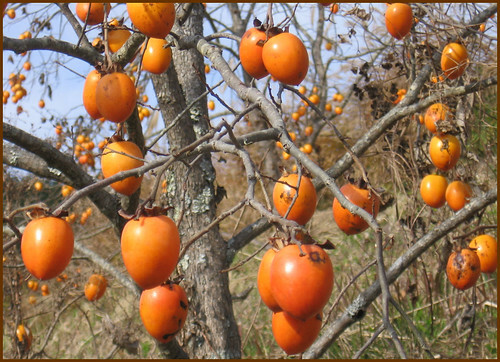 Persimmon wood was flexible and fairly strong and was therefore used to make human-sized bows and arrows for scarecrows placed in rice paddies and dry fields, as can be seen from many hokku and haiga from the Edo period. 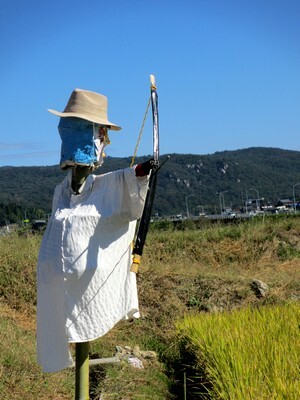 In Issa's time scarecrows commonly consisted of a vertical pole with a small round object or rush hat on top serving as a head and a crossbar serving as two arms to which a bow and bowstring nocked with an arrow were placed. The arrow was pulled all the way back as if it were about to be shot, with one end of the crossbar serving as the left arm holding the bow and the other end serving as the right arm pulling back the bowstring. There is humor as well as pathos, since the same persimmon branch on which the nest has been built will become a bow or arrow held by a scarecrow to scare possibly the same birds away later in the summer. Either there is a mark on the tree trunk or the tree is a persimmon tree grown by someone who every spring makes and possibly sells bow-and-arrow scarecrows just as barley is beginning to grow and before rice planting gets underway -- and just as many birds are beginning to nest near the fields. By late autumn the crow must have become very used to the scarecrow, and the cord holding the bow and arrow to the cross shape must have rotted or been pecked apart. Issa seems to enjoy the pleasure the crow gets as it trashes this condescending human fake that any self-respecting crow could see through. This early autumn hokku is from the 7th month (August) of 1810, when Issa was traveling around in the area east of Edo. The number of trees isn't mentioned, but it sounds like several, since the parents have given their children something very important. Seeing a single persimmon tree isn't unusual, but the parents seem to have seen something unusual and important: a persimmon grove or orchard run by an innovative farmer in the area. The parents, always thinking about their children, have the foresight to realize that this kind of commercial farming done in addition to rice farming will provide a way for their children to rise out of poverty. The trees seem to be growing well now, so the children will probably succeed because of their parents' thoughtfulness and kindness. The wording of the hokku suggests that these considerate, future-oriented parents have helped their children in other important ways as well. Basho had been invited to the villa of a very rich person named 兎苓 in Katata 堅田. This is a greeting hokku to congratulate his host to his riches. The garden was full of trees with colorful fruit. In a small village in 北会津村 North Aizu there is a religious restriction 禁忌 related to the belief in Yakushi Nyorai, not to plant any persimmon trees. Around the year 1922 the farmers tried to get rid of this restriction during the efforts to regulate farming land. Most elders of the villge did not agree to this but in the end they all called a priest and asked him to instruct Yakushi that from now on they would plant persimmon trees 「植えてもよい」. And indeed, nothing happened when they started planting trees. As Janine Beichman relates in her book, "Masaoka Shiki," Shiki was sitting in a tea-shop in Nara, an ancient capital of Japan. The bell he heard was actually from Todaiji Temple, but he said the sound came from Horyuji Temple, the oldest temple in Japan (founded in 607 CE), because it is famous for its persimmon orchards. "Slope of the Persimmon Tree"
This is a very small district.